Posted on December 24, 2010 September 11, 2017 by Margaret & filed under Recipes, Slice of Life. Never fear, we’ve been making this version, sans subway tracks, for 46 years and for all occasions. It will be one of the two dozen desserts on our Christmas table, and it’s always a winner. Hope you enjoy it. For best results, have ingredients at room temperature. Beat eggs until foamy and set aside. Beat ricotta with sugar until blended and add 4 flavors – beating until thoroughly mixed. Pour eggs into ricotta mixture and beat just until blended. Place in oven, and lower temperature to 325 degrees. Bake about 1 1/2 hours or until top seems firm except for center, which should be slightly soft. Leave cake in oven with door slightly ajar for about 1/2 hour after turning the oven off. This prevents the cheesecake from sinking. I just might make that. I’ve been wanting to make our own ricotta (how is that pronounced … riGUT? ), this would be a good excuse. Merry Happy, Trixy, love you! Looks yummy, and different to the cheesecakes I know. I’d want to leave out the anisette. Not a fan. LOL, you’re getting those Italian “c’s” down. so..how is it if you leave out the anisette? not a fan either. Vickie, I’ve had similar versions of this cheesecake with just vanilla flavoring and it was delicious. Give it a try with the flavors you enjoy. Nope, not pudding like at all. It can be sliced. Yum. ‘Can’t wait to try it. I love few things more than an Italian cheesecake but I’ve never made one myself. I’m definitely going to try this. Looks amazing. This looks delicious, it’s going into my recipe box. Thank you, Immaculata. 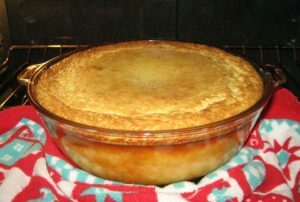 Does this cheesecake remain in the Pyrex pan, or do you invert it on to another plate?